The house is located on the edge of Kadaň, in a beautiful spot offering a unique view ofa bend ofthe Ohře river. It is set onto a natural slope whose gradient influenced the height layout of the individual levels. Grown trees have been preserved between the house and the street. The main residential level - the ground floor - is one meter above the level of the garden on the southern side, which has virtually no impact on the landscape horizon.The ground floor is connected to garden by exteriér stairs leading to a grassed terrace. The calm,external form ofthe house disguises a two-story interior atrium which determines the entire spatial design ofthe house. The atrium, located at the center of the house, connects the two levels, allows the sun into the center and forms an integral part of the live-in space. When the French Windows are open, the atrium becomes a part of the exterior space. 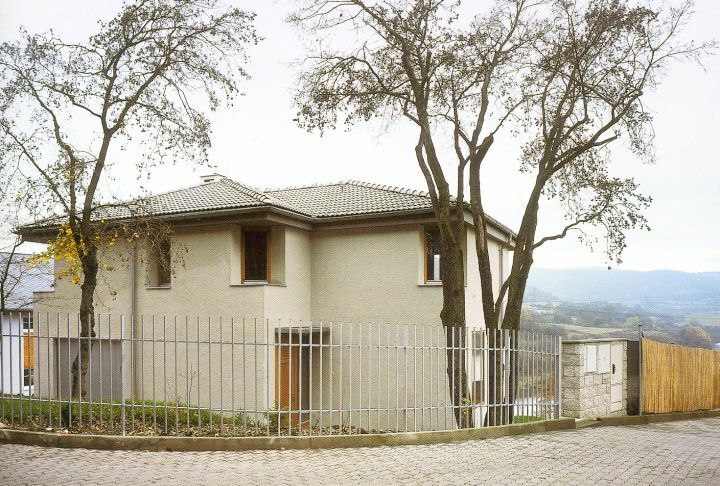 The house was designed for a familyoffour.The first level is occupied by the main live-in area with a kitchen,entrance halí, service rooms and garage. Bedrooms and a bathroom are in the attic. In addition to the master bedroom, the parents háve a study and a dressing room. The cellared section of the house houses a laundry room, technical facilities and a storeroom. The house was rendered in finely combed plaster with a higher mica content.The loadbearing elements ofwalis and ceilings are from ceramic materials. AU the apertures in the house are full ceiling height with a few exceptions (the corner Windows on the first floor are beveled). The design includes pruning bushes in front of the house, by the French Windows, affording měře glimpses ofthe house. From a distance, the house will thus be subtiy integrated with the garden.